In most countries, “gluten free” food labels should not be taken literally. Although you might think that “gluten free” food has zero gluten, allowances are typically made for tiny amounts of gluten. These regulations are based on the idea that a very small amount of gluten (20 parts per million or ppm gluten, which is the same as 0.01g of gluten in 500g of food) is a safe level for people with coeliac disease (meaning it won’t trigger a reaction). The USA, Canada, and EU all have “gluten free” labeling laws that allow some gluten to be present in “gluten free” foods. Australian food labeling laws are based on the idea that there is no safe amount of gluten for a coeliac. In Australia, “gluten free” food must literally have zero gluten. However, the threshold for the “gluten free” standard depends on the precision of our testing methods, or what is detectable. So if our testing improves- detecting 1ppm of gluten, for example- then 1ppm would become the new standard for “gluten free” foods in Australia. There are downsides to having such a strict “gluten free” standard. Having a more stringent standard than the rest of the world makes it is more difficult to make or import gluten free food. This results in less gluten free food being available to consumers, and higher costs to producers trying to manufacturer gluten free food. KOOEE! is a good example – we couldn’t find “gluten free” spices in Australia, and now pay to do testing ourselves at additional expense. Despite the extra work, the more stringent Australian standard is well worth the effort if coeliacs really can’t tolerate any gluten at all. If that’s the case, then the rest of the world should adopt Australia’s standards. 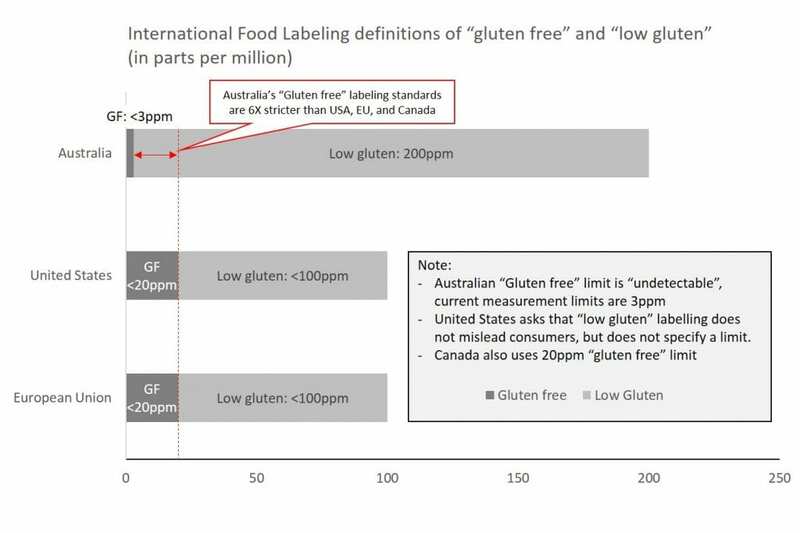 But if coeliacs can handle up to 20ppm, as assumed by most countries, then Australia should change their standards to match the rest of the world. Coeliac Australia has been pushing a review of the law. They recently asked a research team to answer the question, how much gluten can a coeliac safely consume? The answer came in a report appropriately named “Systematic Review of Safe Level of Gluten for People with Coeliac Disease”. After months of reading and compiling results the research team returned to Coeliac Australia with their findings. In short, the safe level of gluten for people with coeliac disease is… unknown. According to their work, there still aren’t enough quality studies to know if small amounts of gluten harm a coeliacs health. Read the details here. This is a bit of an anticlimax, and it highlights how much we have yet to learn about coeliac disease. Until we know for sure that there is a safe level of gluten for coeliacs, Australia will keep its strict standard. Better safe than sorry. We hope we answered “What does gluten free mean?”. 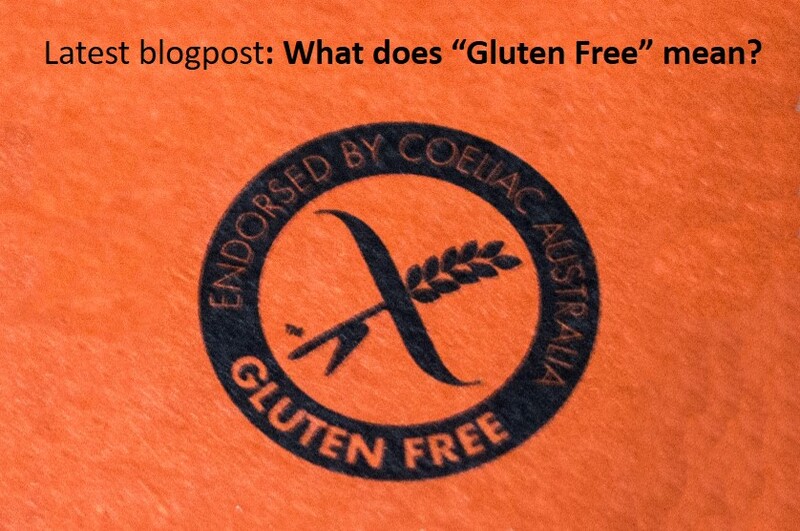 If you enjoyed this article you might also enjoy reading 3 reasons why people choose gluten free diets, and about our endorsement by Coeliac Australia. This is an excellent summary on what gluten free labeling really means. Thank-you.